We start part one of our San Francisco Muni visit at the northern end of the F-Line at Fisherman’s Wharf. Our cameras then move along The Embarcadero filming as we go towards the impressive Ferry Building. Along the route we see former Hong Kong and later London ‘Big Bus’ sightseeing Leyland Olympians and Dennis Condors in action, as well as some other former UK buses as open toppers! From the Ferry Building we turn into Don Chee Way past the Market Street Railway Museum and onto Steuart Street and the busy Market Street. Here we get our first glimpses of the trolleybuses. Market Street is full of action for you to enjoy. We take a ride on PCC 1063 for a journey back to Fisherman’s Wharf. We now take a look at the cable cars. Joining car 21 at Taylor Street we ride to Powell Street, which is right next to Market Street in the busy downtown area. 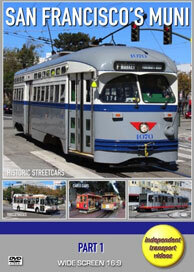 This gives us the opportunity to join PCC car 1079 and ride to Castro. The terminus of the F-Line is on 17th and Castro Street. This Bohemian area is an excellent location to film the trams arriving and returning back to Fisherman’s Wharf. We now continue our journey to Church Street to see the Light Rail in action. We ride on a Milan, Peter Witt tram, number 1807 from Castro. The Light Rail cars are all manufactured by Breda, and we see them operating along Church Street and Duboca Avenue. Now we board PCC 1052 to ride back to Market Street, catching up on more Cable Car action. We make a brief visit in the Cable Car Museum and Powerhouse to see the wheels turning and moving the cables around the city. We also see a Cable Car making the dramatic entrance into the Cable Car barn on Jackson Street! Part one of our visit to the San Francisco Muni concludes at the Taylor Street terminus of the Powell-Mason cable car line. See you in part two!